Fawad Afzal Khan (born 29 November 1981) is a Pakistani film and television actor, producer, singer and model. Khan has established himself as a critically and commercially successful actor in the Pakistani television and film industry. Khan rose to prominence in the 2007 Pakistani movie Khuda Kay Liye, and later gained acclaim as a lead actor in TV shows Humsafar and Zindagi Gulzar Hai, for which he won the Best Actor Award at the Lux Style Awards. In 2014, Khan made his Bollywood debut in the romantic comedy film Khoobsurat. and received Filmfare Award for Best Male Debut. 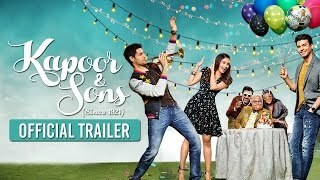 Kapoor and Sons first poster is out !